Mark Lyndon: - I am here in the heart of Bohemia to meet Mr Nejtek The Magnificent Showman, and owner of the Centrum Panorama Cinema Complex, which champions giant screen 70mm film exhibition in this part of Europe I interviewed him through his interpreter Mr Martin Sinkmajer. This Complex would not have been possible without the successful business, which pioneered Neon lit advertising in Europe. How and when did the Neon lighting company begin? Martin Sinkmajer: - Mr Nejtek’s father established the neon lighting advertising business in 1936. We don’t know exactly how many companies were involved in Neon lighting at that time but he is pretty sure that his father started Neon Lit Advertising. ML - That developed into a company, which took over this building – The Centrum Panorama. What were the sequence of events that led to the acquisition of this building, leading to the restoration of a building that was quite derelict? MS – Since his childhood, Cinematography and Cinema Technology fascinated him. He owned a cinema projector when he was a pupil in Primary school. He owns it to this day. Having completed his basic education, he continued by specialising in electronics and focussing on cinema technology. When he was twenty years old, he began his collection of examples of cinema technology. Parts of his collection are here in this building. Although cinema technology was his passion, his main job was in Czech television as an engineer of film production. His dedication to cinema technology never wavered and he kept his contacts with it. In the 1990’s he restored and relaunched his father’s company and began producing Neon Advertising. This happened when his father was still present to witness the renaissance. He was obliged to suspend his passion for cinema technology in order to rebuild the neon business. At the end of the last, and the beginning of this century, he was sorely missing his first love of cinema technology. He resolved to make a life changing decision and started seriously thinking about renewing his interest in cinema technology. He proposed that the entire complex and the equipment it contained should be transferred to the ownership of Mr Nejtek. Adapting and adopting his expertise in the Neon business and having reviewed, analysed and assessed the installation, he came to decision to acquire it all. Now the new owner, he formulated a business plan and drew up a budget for a complete restoration and the whole enterprise was covered by his neon company. At the time he was deeply immersed in neon advertising and one of his most important clients was Tesco of Great Britain. He won an exclusive contract with them for neon advertising. He fought very hard to manage the neon business as well as supervise the restoration of this cinema complex. 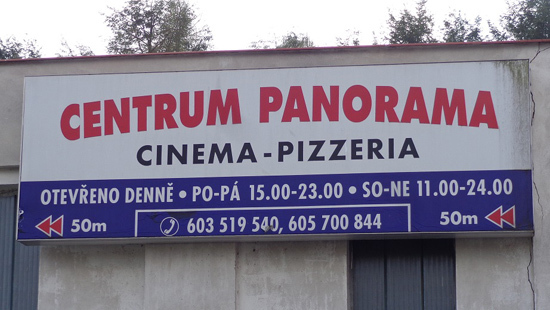 It finally opened under the aegis of his company Elektroneon, but kept the original name of Cinema Panorama completed to emphasize added services as pizzeria, restaurant and cinema to a brand new name - “Centrum Panorama”. The paramount factor in his decision to acquire the Centrum Panorama was his strong desire and curatorial ambition to revive and celebrate 70mm film technology. Because of the enormous structural problems of this building, he was obliged to postpone the project. He was determined from the outset to achieve his goal to see the project through. 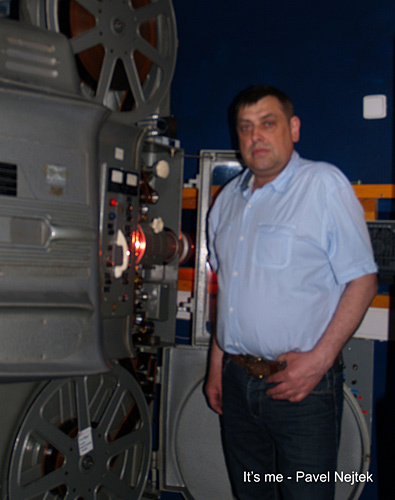 And now that the technology is fully operational, the cinema has been open since 2005 and 70mm cinema since 2008. There was another issue to be resolved. He decided he needed to open a fully licensed restaurant in this complex. He had to apply for a license, it was not easy. It was clear from the start that operating a cinema on its own could not be a going concern. It had to be a cinema plus restaurant to be viable and balance the books. Quite simply, the restaurant subsidises the cinema, which attracts the clientele. A cinema alone could not make a profit in this country. 2010 was a great year for the project. The transfer of ownership was completed. We acquired the second part of the existing complex, originally a hotel with a dance hall. The restaurant had not been an original part of the complex. The restaurant now occupies the original foyer of the cinema. The area directly above us was a hotel and a ballroom. To begin with, the building was in such a derelict condition as a result of too many openings to the elements, that major structural work had to be done. They had to secure the integrity of the building by constructing an entirely new roof. Then they had to await better times to continue the restoration. ML – Was it a difficult project? MS – Very difficult and it still is ongoing. It was vital to resolve the considerable structural problems that beset this building before anything else, otherwise it would face certain demolition. ML – It was an important cultural and heritage site? MS – Exactly. The Centrum Panorama is still undergoing renovation in a continuous development process. ML – The philosophy underpinning the business model is one of continuous development. For example you have recently installed a brand new and very impressive screen from the specialist company Harkness. Now visitors will see panoramic motion pictures on a 135m2; curved screen which has a chord, in other words a depth, of 1,8m. Before that we updated the optical system of our cinema projectors featuring – an upgraded high fidelity cinema sound system, especially for magnetic sources of sound. 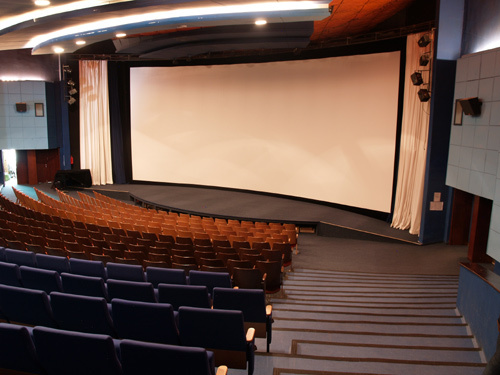 This led to interoperability between original and new digital cinema projectors. MS It is a philosophy of continuous progress through continuous development. ML – You have here a world class collection of rare and vintage film projectors that outclasses even the Cinematheque Francaise, which I saw recently. MS We have. The next step in our development philosophy will be to install an outdoor cinema for the summer season in newly acquired land adjoining this site. 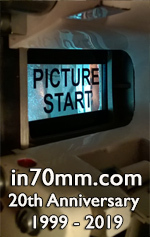 Ideally, we would hope to feature 70mm projection for our outdoor cinema. ML What are your hopes and ambitions for the future? MS – In the further future, there is space to develop a museum dedicated to cinema technology and to revive an important part of the original function of this building as a hotel. It is a longer term aspiration from the financial perspective. Finance is never easy. The original intention was to establish financial stability to provide a firm foundation for a viable enterprise. But bear in mind that none of this would have been possible if the main purpose had been other than conservation. ML – Many thanks for granting this interview.